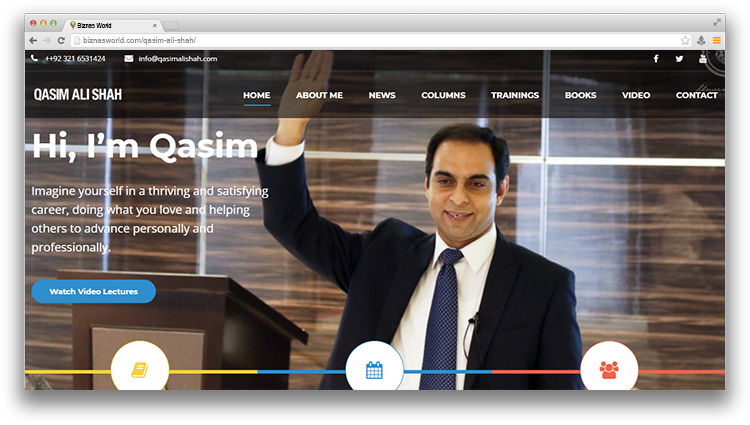 Description Qasim Ali Shah is a well-renowned teacher, an inspirational speaker and leader, a success coach and a practical educationist of Pakistan. He is amongst the top entrepreneurs of the country, a best -selling author of 12 influential books, a famous radio host, chairman of Bestival book fair Lahore, a director of native schools system, Tour ambassador of Uzbekistan government, and intellectual on T. v, He is the founder of Qasim Ali Shah Foundation which is working on the moto that Pakistan will transform if thought transforms. Address 8 Raza Block Allama Iqbal Town, Wahdat Road Lahore.